Grab Your 10 Pounds Of Muscle In 1 Month Workout & Meal Plan, “How To” Exercise Video Lessons & my famous Top 20 Muscle Building Mistakes Report � 100% FREE ! 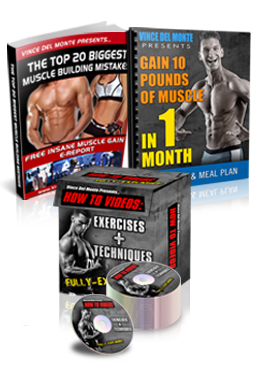 Your FREE muscle building gifts expose all the reasons you�re struggling to pack on pounds of rock-hard shredded muscle and show you exactly how to pack on PURE MUSCLE MASS in weeks, not months! How to eat and train to gain 10 pounds of eye-popping and confidence-boosting muscle no matter what you�ve tried in the past (Get a complete workout and meal plan)! The shocking truth about the bodybuilding mafia and supplement cartel � learn how to avoid BS products scamming you out of your hard earned money and WHY the bodybuilding industry WANTS you to stay weak and thin. (Video lessons expose the truth). "How To" Exercise Video Lessons: Learn scientific-based lifting technique - the same technique I used to gain 41 lbs of muscle in 24 weeks 100% drug free! Enter your email below to get your FREE Muscle Gifts sent straight to your inbox. * Your email will be kept safe and never shared with anyone � ever. You can unsubscribe at anytime. Enter your best email and you�ll get instant access to all of my free muscle-pumping gifts absolutely free. This is simply my small way of saying THANK YOU for checking out my site and trusting me to get you lean and muscular beyond belief.